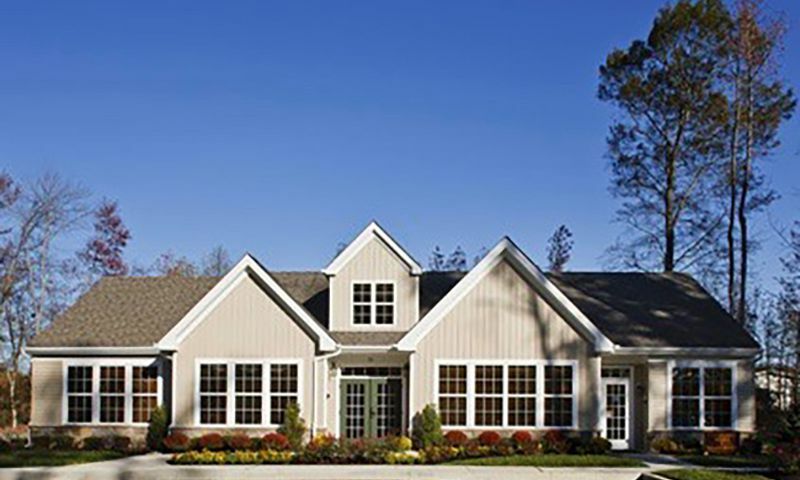 Village of Cecil Woods is a 55+ community in Elkton, Maryland. This active adult neighborhood features affordable single-family homes built on premium lots that back up to private woods for a natural and quiet setting. Residents will love the small-town charm and great amenities found at the centrally located clubhouse where neighbors gather for fun activities and social recreation. Situated between Elkton and North East, MD, residents have easy access to major roadways, medical facilities, attractions, and shopping options. Village of Cecil Woods is also close to Chesapeake Bay as well as plenty of golf courses and other outdoor recreational opportunities. The clubhouse in the Village of Cecil Woods provides great indoor amenities for all residents to enjoy. Active adults stay in shape by utilizing the exercise room. The lounge and catering kitchen can be used for hosting parties or preparing a snack for a community event. Homeowners get together to have fun in designated social areas to play games, billiards, and cards. Clubs can meet in the conference room to discuss updates and the library is a quiet space to enjoy a good book or some alone time. Outdoors, residents delight in the beautiful gazebo to get some fresh air. The community's scenic and stocked fishing ponds are great for outdoor recreation. Homeowners can take advantage of the walking and biking trails that surround the neighborhood for leisurely strolls or a morning jog. Construction of Village of Cecil Woods began in 1997 by McKee Builders. This age-restricted community will consist of 235 single-family homes upon completion. Active adult homebuyers can choose from three ranch-style models that are available as new construction or resale. An affordable monthly homeowners' association (HOA) fee includes sewer, trash collection, snow removal, and access to amenities. Single-family homes in Village of Cecil Woods range in size from 1,588 to 1,880 square feet. They have three bedrooms, two bathrooms, and optional one-car garages. Some of the standard features include eight-foot ceilings, spacious master suites, gourmet kitchens, laminate countertops, ceramic tile back splash in kitchens and bathrooms, maintenance-free vinyl siding, sodded yards, and Energy Star certified appliances. Village of Cecil Woods provides a social environment where neighbors become fast friends. Residents can take up new hobbies or explore old interests that they never had time to do before. Homeowners can get together to play bridge or billiards or whip up their favorite dish to bring to a community potluck. They can go fishing with friends in the stocked pond without having to travel far from home. This 55+ neighborhood also hosts social events for all residents to enjoy. Whatever residents choose to do, they are sure to stay busy in this active adult community. Located in the heart of Cecil County, Maryland, Village of Cecil Woods is near many conveniences as well as attractions. Residents are just minutes away from major roadways like Highway 40 and Interstate 95 that makes driving around town a breeze. With easy access to Chesapeake Bay and Elk Neck State Forest, outdoor recreation and water activities are readily available such as boating, fishing, crabbing, and swimming. There are golf courses in the area that are about 15 minutes away like Patriots Glen National Golf Club and Chesapeake Bay Golf Club at Rising Sun. Medical facilities can be found in Union Hospital that's twelve minutes away. Baltimore and its international airport are about an hour's drive away. Village of Cecil Woods is a charming, small town 55+ community that's close to great attractions in Elkton, Maryland. There are plenty of activities available in Village of Cecil Woods. Here is a sample of some of the clubs, activities and classes offered here. Single-family homes in Village of Cecil Woods range in size from 1,588 to 1,880 square feet. They have three bedrooms, two bathrooms, and optional attached one-car garages. Some of the standard features include eight-foot ceilings, spacious master suites, gourmet kitchens, laminate countertops, ceramic tile back splash in kitchens and bathrooms, maintenance-free vinyl siding, sodded yards, and Energy Star certified designs. 55places.com is not affiliated with the developer(s) or homeowners association of Village of Cecil Woods. The information you submit is distributed to a 55places.com Partner Agent, who is a licensed real estate agent. The information regarding Village of Cecil Woods has not been verified or approved by the developer or homeowners association. Please verify all information prior to purchasing. 55places.com is not responsible for any errors regarding the information displayed on this website.